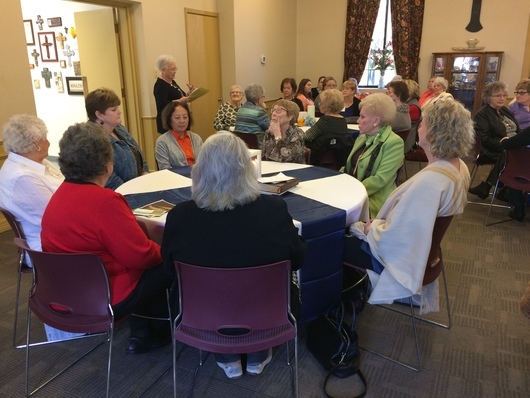 Ladies Luncheon was held immediately after the Worship Service in Memorial Hall. Click HERE to see more about it, including a surprise visit from our favorite twins! 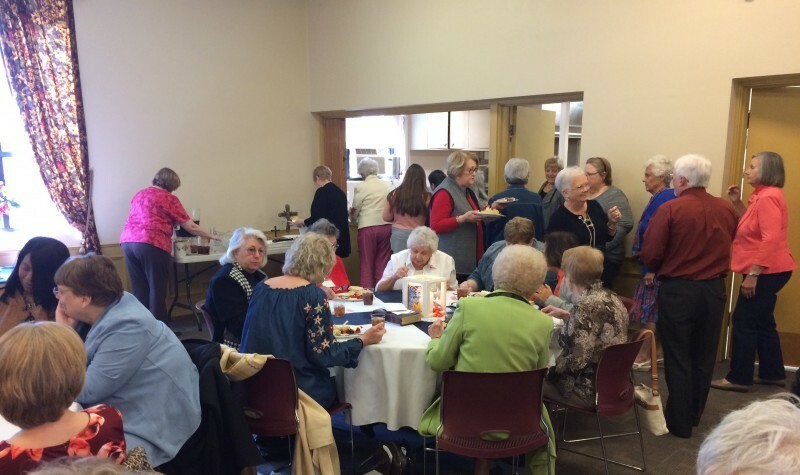 The FUMC Ladies of the Church met September 24, 2018 with 31 women in attendance. We had lunch provided by Cindy Lovelace, Christen Vick and Kaylyn Venable. Cindy Lovelace lead an interactive review of a survey sent to those who attended the last meeting. 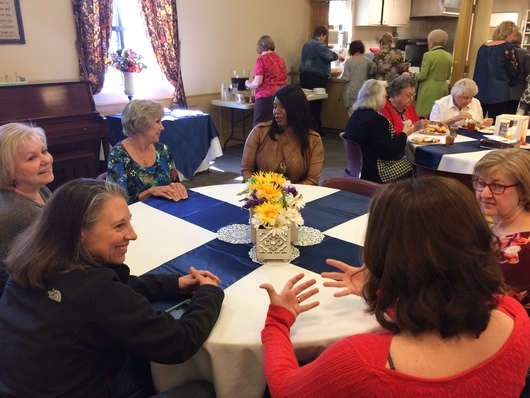 The Sisterhood will meet every other month at the church in Memorial Hall and have lunch. Most want to learn about missions and learn about the United Methodist Women. Inspiration: Acts 2: 44-47 We want the Sisterhood to be a supportive community of women who help and support each other. We also agreed that we want to work with local missions by helping those in the Ennis area. Learning Together: Cindy Lovelace gave facts about the Ennis mission field. Ladies had the answers to questions about Ennis on cards on their table. They discovered that half of the population of Ennis (18,890) is under 31 years old with 24% living below the poverty level. With over 6,000 residents under the age of 18. 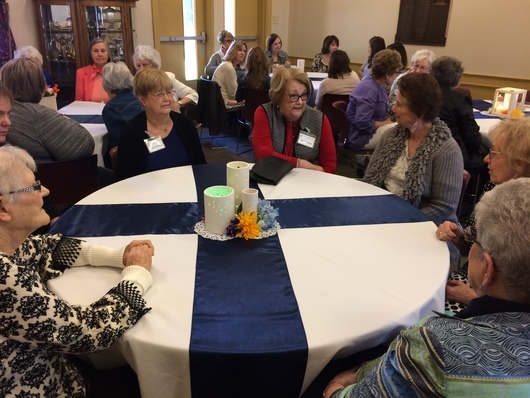 Learning from Each Other: The Sisterhood discussed various charitable organizations in Ennis that would be mission fields for service. Christen discussed the Angel Tree project coming in November which requires many hours and much help. The Sisterhood will be available for helping with that project in any way needed. After much discussion, we adjourned with prayer. Watch for information about our next meeting in December. We had a lovely Ladies' Luncheon this past Sunday and want to thank everyone involved in making it possible and all who attended. The meal was prepared by Howard and Amy Callahan and was absolutely delicious. The fellowship came easily for this group of almost 50 chatty ladies, but we did have to clear up a bit of confusion with the inviting table decorations. It seems that the colorful stones that accented the flower centerpieces looked a lot like jelly beans. Once we announce the decorations were not edible, all was well. Hahaha! We had a fun group of ladies and I think everyone who attended had a good belly laugh at some point during the gathering. 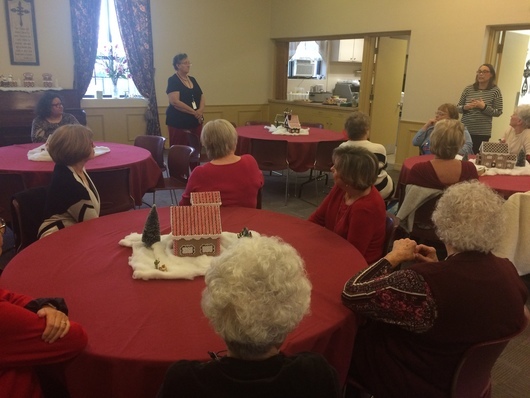 After the meeting, all ladies that were interested in having an organized ladies group at FUMC stayed to talk about what we wanted that to look like. Cindy Lovelace volunteered to be the President, and we will be filling in the other officer positions by the next meeting. 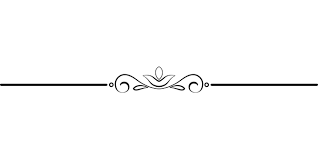 Everyone agreed that the Ladies' Luncheon should be a recurring event every quarter and as we meet, we will be discussing what types of ministries and activities we would like to be a part of. This is an exciting time for the ladies of our church and we would like to get all of our ladies involved, so please feel free to pass this on. 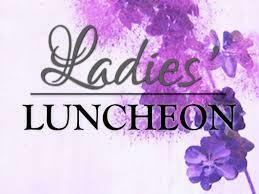 Be on the look-out for more information about our next Ladies Luncheon! at Ennis First United Methodist Church! For more information and pictures CLICK HERE for the slide show of the first luncheon!